Join us May 4-5 for Commitment Weekend. Join our team of nurturing, dedicated, and caring staff. "We Have Been Richly Blessed"
Read Bob and Jean's Story. "Be kind and compassionate to one another, forgiving each other, just as Christ forgave you." 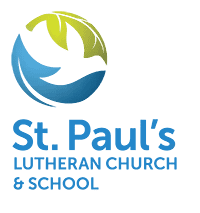 St. Paul's Lutheran Church & School is a congregation that is centered on God's love, welcoming everyone as we grow in faith through Christian community for Christ's service. Mark your calendars and stay connected with the various events going on at St. Paul's Lutheran Church & School! Worship centers us on God's love in our personal lives and our community. Each week, we join in praise and thanksgiving. No matter your background, preferred worship style, or schedule, St. Paul's welcomes everyone to join in the celebration. St. Paul’s Lutheran Church & School is located in Waverly, IA and is affiliated with the Evangelical Lutheran Church in America (ELCA) in the Northeastern Iowa Synod. We are a 1,300 member congregation with more than 450 people worshipping each week. St. Paul's Lutheran School educates more than 220 students preschool through sixth grade. We had a very meaningful Lenten journey focusing on a variety of justice issues. Thank you very much to our presenters: Mark Mueller, climate change; Kris Meyer, children; Marcus Newsom, racism; Susan Vallem, poverty; and Karen Thalacker, women. If you would like to listen to these speakers' messages, they can be found our website at https://stp.center/sermons. St. Paul's School offers preschool and elementary education for students through 6th-grade and is committed to providing quality education in an environment where Christian faith is taught, learned and lived. Picture yourself at the Spring Social Event. Your ticket price includes: heavy hors d'oeuvres, one beverage ticket, adult evening out, and live and silent auctions. Come have a blast and support St. Paul's School! Prices increase after May 2, so purchase yours today! Thank you for your interest in St. Paul's Lutheran Church & School programs. Here, you can explore a variety of opportunities that exist for you and your family. Welcome to St. Paul's Lutheran Church & School in Waverly, IA. Please, join us for worship, and see what we are all about. All are welcome here! St. Paul’s Lutheran School is dedicated to providing students with a quality education in an environment where Christian faith is taught, learned, and lived. "... stewardship is nothing more than giving back a portion of what God has given to you, which is blessing after blessing."